You know when you're putting together a puzzle and all you have left are a few pieces and it's exciting because you're so close to seeing the whole picture? 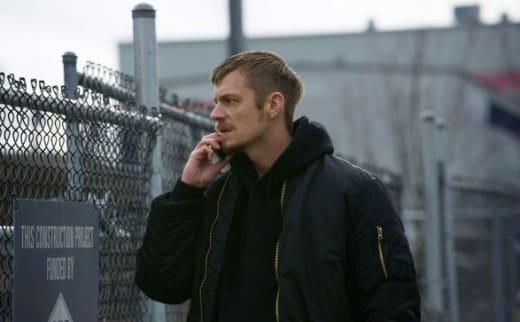 The Killing continued to push the seemingly random parts and players of the show closer together this week, revealing the ultimate connection with mob boss Janek, Mayor Adams and Indian Chief Jackson. There's a feeling that the end is in sight and with "72 Hours" it's less like one of "oh, just get it over with and tell us" and more like "let's bust this case wide open and bring the whole corruption down upon itself." Or at least Holder would have something more clever to say in regards to the case, but even he is brimming with anticipation to solve it. And as much as the show is preparing to reach its climax, and despite certain twists and turns that feel forced, it is looking to strike its season end note on a big high. Yet, even with the anticipatory notion, the series for the most part has done a fantastic job in its subtly. There aren't flashy explosions or glossy car chases and the episode really pushed along a pace that felt moving. Each component was significant especially in pulling everything finally together. In doing so, there was plenty of pulling from the past, some more recent, some way before viewers caught their glimpse of Sarah Linden in the pilot. Bringing back Bennet Ahmed and Linden's ex, even if for a brief moment, reminds viewers where the drama has come from; and also does a nice little job of not completely sweeping characters no longer integral to the case under the rug. In a sense, the episode brought a type of closure, especially with Stan fixing Ahmed's porch light, bringing in the dog for the kids to take care of, calling Rosie's phone and finally shutting out her bedroom light. Sure, it doesn't change everything in that one instant - Ahmed may never forgive him, his children might be horrible at dog watching and Stan's anger won't completely disappear - but it's a step in the right direction. As for Linden, viewers were given a chance to learn a bit about the case that had haunted her to the point of putting her in the psych ward. And as much as it was insightful to learn more about her character, the discovery that took place in the specific location felt tainted in a way. Not from a story stand point but the fact that she was essentially forced into the situation to open up by one of the most obnoxious psychiatrists ever. How can you stay sane in a place like that? The questions alone with the upwards inflection made me want to jump across the table at the psychiatrist. Mireille Enos really got a chance to express some acting chops by teetering on the edge of her own sanity. Not only was Linden trying so hard to keep it together and answer the questions, but there was a distinct understanding that opening up was having its own damaging effects. She clearly wants to get this Rosie Larsen case right after feeling like she put the wrong man in jail for a previous case. And to top it off, the emotional impact of abandonment had its own chance to hit her psyche. No wonder she's so quietly driven at her work. Even the long shots of just Linden in the chair trying to talk had an emotional impact. All I wanted was for Holder to rush in and get her out of there. He did, eventually, but Holder was driven in his own right to solve the case and get everything right back on track. 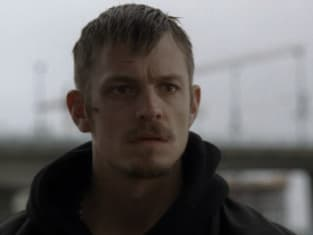 Not only does he care for Linden, (and it's not one necessarily of being in love and more of compassion and connection) but he wants to help her finish what they started. Even on his own he managed to find plenty of clues that exposed Rosie's unfortunate wrong place, wrong time situation that simply got her killed over a far bigger conspiracy than was first thought. Another quiet episode, but The Killing does them with such a tenacity that even those still and silent moments scream as loud as can be. I wonder what Michael Aames and Mayor Adams were truly hoping to gain from sabotaging their own project. And will that hidden bloody keycard be the so called "key" to putting everything together? Like Holder said, "Let's solve this case."